Dawn Michelle Staley (born May 4, 1970) is an American basketball player and coach. Staley is a three-time Olympian and was elected to carry the United States flag at the opening ceremony of the 2004 Summer Olympics. She was named the University of South Carolina women’s head basketball coach on May 7, 2008. After winning the gold medal at the 1996 Summer Olympics, she went to play professionally in the American Basketball League and the WNBA. In 2011, Staley was voted in by fans as one of the Top 15 players in WNBA history. Taylor had a lot of fun and even got to meet the players and the coach and shake their hands afterward. She was pretty excited. She got a poster, and Pops gave her these little cards of all the players that he got with his season tickets, like baseball cards. 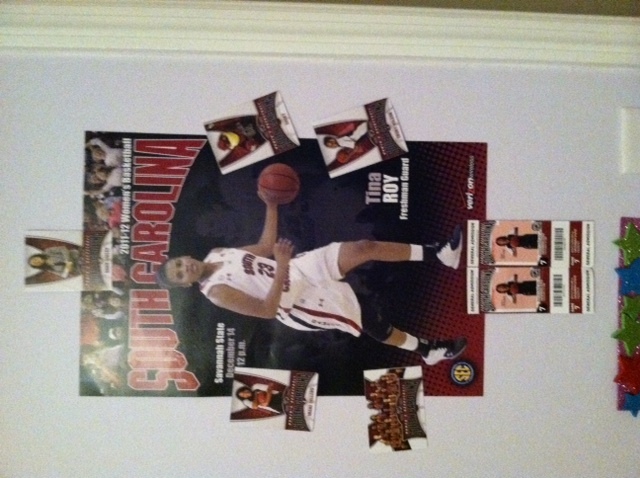 She came home from the game and wanted to put them all on her wall in her room. She says her favorite players are #0 and #1 and the coach. It’s good to bring a little diversity to her purple, flowery, princess, girlie room. Dad says there’s another game New Year’s Day…..